The October Magic White Shi-Shi Camellia brings flowers to your garden from October to January, and what flowers they are. Perfectly symmetrical, with almost 50 petals in every bloom, and pure, pure white, the large blooms come in succession, each one lasting a week before neatly falling off, leaving your plant always looking perfect. The evergreen bush grows just 4 feet tall and across, with a dense, bushy habit that carries many flower buds. From zone 7 it can be grown outdoors, and in colder zones grown in containers and kept in a bright, cool place for the winter months, where you can enjoy the perfect blooms, protected from the weather. Grow the October Magic White Shi-Shi Camellia in partial shade, or the light full shade found on the north side of a wall. It will grow in the dappled shade from overhead trees, and it enjoys some morning direct sun too. It should be grown in acid soil, with a pH between 5.0 and 6.5, that is rich, moist, andwell-drained. 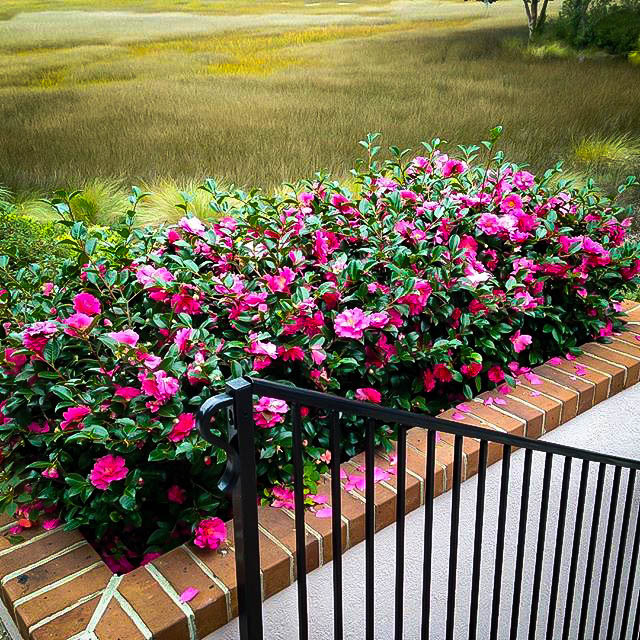 If you have alkaline soil, simply plant in a pot or planter box, using soil for acid-loving plants, and fertilize with camellia fertilizer. 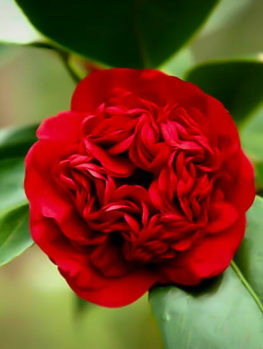 This plant is resistant to the major camellia diseases, and it is easy to grow. No pruning is required. A big highlight of fall in warmer zones is the arrival of the first camellias. Many people think of these gorgeous ‘Roses of the South’ as late winter and early spring blooms, but while that is true for many, there is a whole second group that bloom starting in late fall, and these bring lots of excitement and color from October onwards. Snow is of course rare in warmer zones, so there is something magical when a green bush opens pure-white blooms at that season, and white camellias are one of the most beautiful flowers in the world. When we saw the beauty of the White Shi-Shi Camellia, we were blown away, and knew we wanted to bring it to you. We are thrilled to have found a top-quality source, so get ready to bring crystal white beauty into your fall garden. 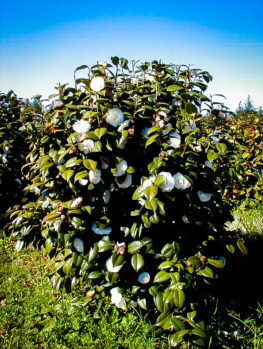 The White Shi-Shi Camellia is an evergreen shrub with a broad and bushy form. The upright, arching branches create a shrub that is 3 to 4 feet tall and the same distance across. The deep-green leaves have a smooth, glossy surface, and they are broadly oval, about 1½ inches long and 1 inch across. The edges have small ‘teeth’ along them, but these are soft. Leaves stay green and healthy for 2 or 3 years, before turning yellow and quickly falling, so your bush is always green and lush. 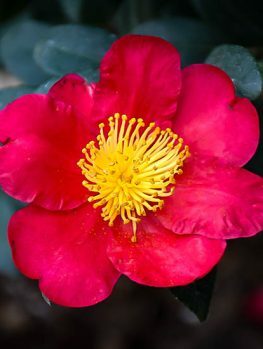 Flowering begins in October in most areas, and will continue into early January, bringing color and interest to your garden for most of the quietest part of the year – this is why early-blooming camellias are such a valuable addition to the garden. 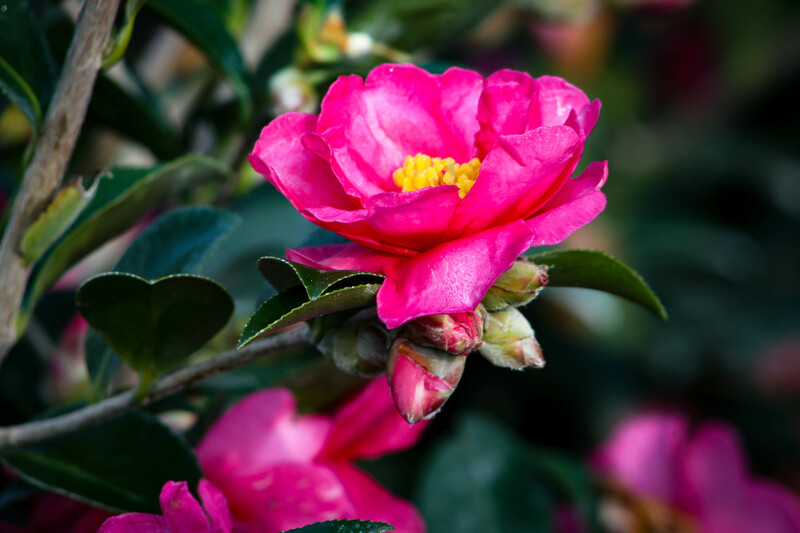 Each flower lasts about one week, and unlike some camellias, where old flowers cling to the plant, looking unsightly and needing to be removed by hand, on the White Shi-Shi Camellia they naturally drop to the ground, so your plant is always clean and fresh. Flowers appear in succession, with 4 or 5 flower buds on each small side branch, covering your plant with many buds, coming one after the other, to keep the plant in bloom for months. The large flowers are a full 3 inches across, and they seem to have been constructed by a jewelry maker with a compass, they are so perfectly symmetrical and regular, with layers and layers of almost 50 overlapping petals, each group smaller than the previous one, moving into the center of the flower. Camellia experts call this a Formal Double blossom. The size of the White Shi-Shi Camellia is ideal for a smaller garden, or where you need a lower plant for the foreground of a bed. 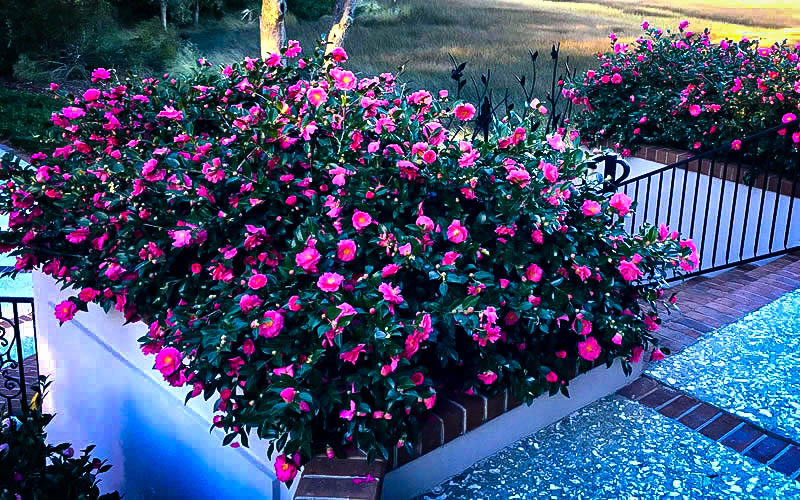 Smaller camellias are perfect for growing in planter boxes, or pots and containers, so that you can move them around the garden, or bring them into a conservatory or cool sun-room during blooming, where they will be protected from rain and frost, allowing you to enjoy every flower in its perfection. If you have a cool, bright indoor space, you can grow this plant even in the coldest zones, keeping it outdoors from spring to fall. The White Shi-Shi Camellia grows best in partial shade, perhaps with some morning sun, or the dappled shade from overhead trees. It will also grow well in continuous light shade, especially in hotter zones, so it is perfect for planting along a north-facing wall, or in an easterly-facing aspect, where it will receive some morning sun. It can be grown in the open, or planted up against a wall, fence or trellis. 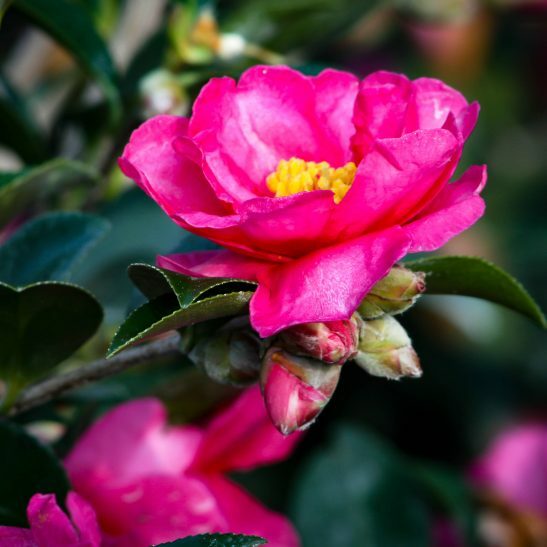 Plant the White Shi-Shi Camellia in acid soil that has a pH between 5.5 and 6.5. A simple kit or probe from the hardware store will tell you this if you don’t know it. An even simpler way is to look around your neighborhood. 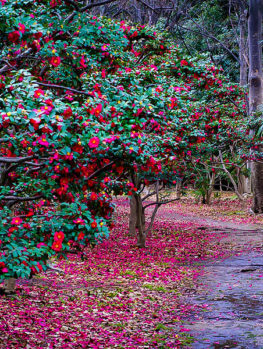 If your neighbors are already growing camellias and azaleas in their gardens then you can too, without even needing to take a test. If your soil is too alkaline, then plant in a pot or container, where it will grow perfectly for many years. 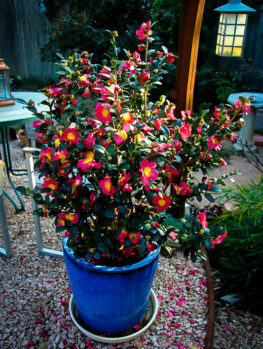 Use a pot with a drainage hole, pot into soil blended for acid-loving plants, and use liquid camellia fertilizer for the best results. No pruning is needed for your tree, and this variety is resistant to major camellia diseases, such as root rot (Phytophora cinnamomi) and dieback (Glomerella cingulata), so you know it is going to be always healthy and easy to grow. 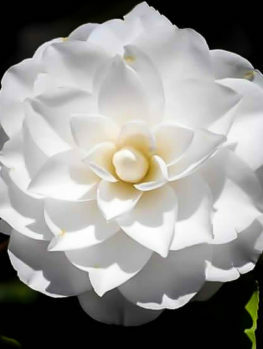 The White Shi-Shi Camellia was created by Robert M. Green Jr., at his nursery in Fairhope, Alabama. His goal was to develop a new line of camellia bushes – fall-blooming plants that were more compact and that bloomed over a longer period than existing varieties. All his new bushes use the name October Magic to show they are part of his special collection. 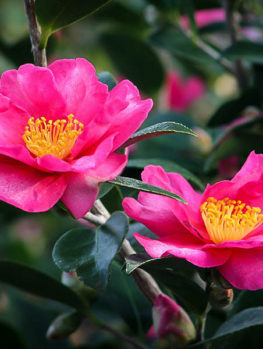 In 2000 he gathered seed from an older sasanqua camellia variety with pink, semi-double flowers, called `Shishi Gashira`. Among the many seedlings he found one with amazing, formal white flowers, and just the compact size and long bloom period he was looking for. After testing it for several years he patented it using his breeding number, ‘Green 02-004’, in 2017. It is today sold as October Magic White Shi-Shi. 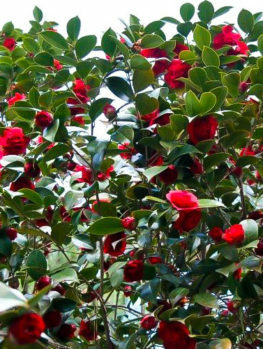 This break-through October Magic series has camellia lovers very excited, and they cannot get hold of plants fast enough – the demand is far beyond the supply. We have a limited stock of White Shi-Shi from an excellent grower, so order right away, as our stock will be gone very soon.